Hey Beautiful Ladies! If you read my blog regularly you will know that I recently reached 2000 GFC followers and was absolutely OVER THE MOON. As a super duper massive thank you for reading my blog and continuously supporting me, I am holding an International giveaway, yey! I've only ever done one giveaway previous to this when I reached 100 followers so as that was quite some time ago now I only thought it was right I thanked you all and gave you the chance to win some lovely goodies. When it came to deciding what the prize would be I took to Twitter to ask you lovely lot what you would like to see and the most popular answer was a selection of my favourite products. So with that being said, I picked up these lovely goodies that I use and love myself or that have been on my wish list for quite some time. Again, if you read my blog regularly you will know that some of these products have actually featured in some of my previous blog posts. I have bought all of the products with my own money except the eyelashes which were sent to me by Girls with Attitude and ND Makeup Artists. So a big thanks to them for letting me include them. I've also tried and worn these myself and like the other products, love them. I've tried to include products that will suit everyone and that you could all get use out of so I'm hoping you like everything I have picked. If you like what you see and want to be in with a chance of winning all you have to do is enter using the Rafflecopter widget below. The only compulsory entries are that you must be following my blog via GFC and must leave a comment below. Theres a few additional entries too if you want to increase your chance of winning. As I said this is an INTERNATIONAL giveaway so you can enter anywhere in the world. I'm pretty excited about this as my last giveaway was UK only. It is open for three weeks so you have plenty of time to enter. Good luck everyone & thanks again for making my blogging experience so wonderful! I love your OOTDs and your hauls! I am new to your but I have been reading so much of it and I love the content! I have only just started blogging and I have to say yours has given me such inspiration for my future posts - thank you!! Congratulations on reaching 2000 followers you really deserve them :). only one favourite thing...waaah!? i love your layout and i loooove your photos, great quality and they always look professional but not showy-offy/offputtingly so...if that makes sense.. congrats on 2000+ followers, you deserve it!! Amazing giveaway! I love your reviews, they're always really detailed and you can tell that you put a lot of effort writing them - on some blogs it's like they've just copied a load of stuff from a press release/website. .. And congrats on 2000 followers!! I love your layout, and the variety of posts you write. You're blog is one i automatically check regardless :) I loved your recent post you did with the autumn eye-make up look. i love the layout - and all your lovely posts! Congratulations :) And that is a very generous give-away. I love your hair tutorials and hauls:)! I love your posts. You obviously put a lot of effort into them and I really enjoy reading them. I love the way you write and your layout! I love how cute your blog is when you look at it, but most of all I enjoy reading what you have to say, your honesty and personality really shines through! I love how you have such a variety of posts to read! you don't stick to just one type which always keeps it interesting and fun. what a great giveaway!! congrats on all of your success! Congrats on all the followers- very much deserved. I love the layout of your blog and your blog genuinely interests me!! Your site is great, I love reading it but you know this because I've already told you (but you deserve it again hehe). And your site is great because you are candid, down to earth, and ...nice Miranda M.
Lovely giveaway Kayleigh :) Congrats on 2000 followers, you really deserve it - I honestly think you are the most refreshing, genuine blogger out there! Congratulations on 2000 followers! I would love to reach that some day! I love the variety of posts on your blog! Thanks for such an amazing giveaway, I'd love to try the real techniques! I love fact that it's just so girly! Nothing better than reading a lovely blog about all things beauty :) congrats on the followers! Wonderful stuff! I love your reviews and the way you present everything. It is simple and very clear, easy and wonderful to read. Amazing giveaway, one of the BEST I've seen in a long time! Just wrote on your Instagram about how awesome this is, I'm definitely entering! :) been following you from the start, it's so nice to see bloggers doing well, wish mine could be as good! I love the reviews you give!! they're always so honest! Amazing products, inspires me to use them! i love your personality and the way you write :-) amazing! found you on instagram!! 2000 followers!!?? ?really nice!!congrats!! !and kisses!! !love your blog and the products you mention!! Congratulations on reaching over 2000 followers! Congratulations on all the follows! I think your layout and ideas for posts are amazing! Congratulations on the success of your blog. The thing I love about your blog is the realness of it all. Your 100% truthful and not fake! Keep on doing what your doing! I love your hair tutorials, so handy! I love your blog, truly always lovely to read! I just love the pink! 1) Your personality- you are so sweet and so easy to get along with. I love that you reply to so many of your comments. 2) Your GORGEOUS- Seriously. 'Nuff said. 3) Your reviews- So helpful and I like that you review a lot of products so whenever I need a review, I know to come to your blog. 4) How often you post- I love that you always have new, fresh content up on your blog. 5) Your layout- It's simple, cute, and girly all at the same time. 6) Your writing style- You write so casually, like your our friend talking to us. 7) Your pictures- Such high quality and so fun to look at. love the whole layout and overall appearance of your blog, and your reviews are always so helpful and i buy so much on your recommendations! congrats on the 2000 followers you deserve it! I love reading your make up posts, because you always apply your make up flawlessly and your pictures are always gorgeous!!!!! I love your detail and outfits, because you're such a stunner! I've just come across your blog from the twitter hashtag #bblogger. Having a look through your blog, I'm really liking your outfit posts! You have a lovely bold style. You're obviously really generous too, with such a lovely giveaway! I love the colours used in your layout and how amazing your photos are. i love your outfit posts!! Your layout is so simple, effective and cute ! <3 your posts are brill, they make a great read! Such an amazing giveaway! Congrats on 2000 followers! I love your layout/header etc. It really mimics the tone of your posts. Your photographs are always nice too! Congrats on your 2000+ followers! You deserve it for brilliant reviews you write! Love your blog layout and hauls. Really interesting. Congrats on your followers and nice giveaway. the simplicity of your blog layout works really well and I also love your reviews of products, infact I like a lot of your posts! congratulations on making 2000, that's such a good achievement! I love your blog design, it's so cute :) you always come across really friendly and nice too! I love how your blog is so inspiring and inventive. I read it every day! Lovely Giveaway :) I've just come across your blog and I'm a new follower! I love love love your layout!!! 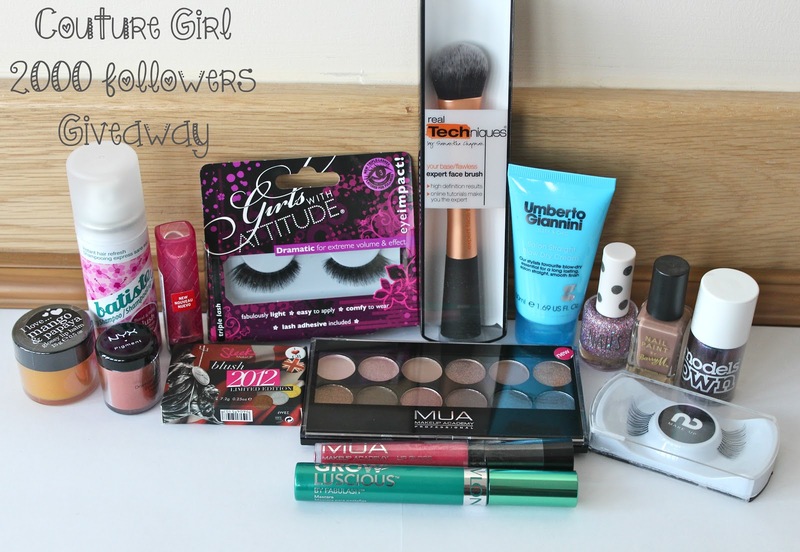 Thank you so much for putting this giveaway together, It's amazing and full of products I've wanted to try for ages. Fingers crossed! 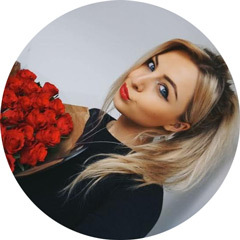 I love your blog because of your gorgeous layout, your honest writing style, your detailed reviews and your pictures are always great quality. The makeups are awesome. But my favorite thing is the monthly favourites!! ps: thanks for this giveaway. i love everything but mainly the reviews! this is so sweet of you, love how many followers you have gained in the amount of time ive been following, you deserve it! this is like the best uk giveaway haha, models own, sleek, barry m, topshop!! What an awesome, generous giveaway! I'm a new follower and can't wait to keep coming back and reading your posts! I love all the pinkness! I absolutely love hauls, I love seeing other people's style and seeing what's out there to buy.